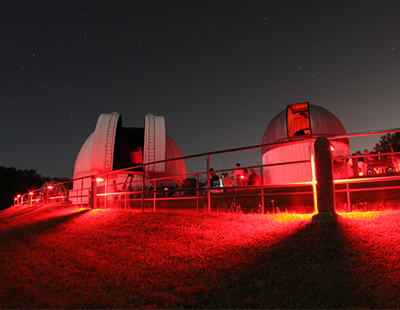 About 45 miles southwest of Houston, there's a spot where amateur astronomers go to peer into deep space. The George Observatory is in need of significant repairs to keep people gazing into the heavens. In the middle of swampy Brazos Bend State Park, there’s a little glen long known as Buzzard Hollow. The buzzards are still there, technically vultures, that migrate down from Ohio for the winter. But they now have to share the space with the George Observatory. The observatory is home to the largest telescope in the country that’s for public use. Peggy Halford is director of the George Observatory, an education arm of the Houston Museum of Natural Science. Halford says there are a lot of things that make this 36-inch telescope special. It’s about 50 years old and was built by the same company that made the Hubble telescope. Its controls look like something straight out of an old 1960s NASA Apollo mission. But age is getting to it and the 500-pound mirror inside the scope has been getting more and more cloudy over the past few years. So the museum has launched an S.O.S., or Save Our ‘Scope, effort to raise $80,000 to repair the mirror and spruce up the dome that protects it. When no one is around, Halford has her own favorite view. The museum hopes to raise enough money by April to start the repairs and have everything finished in time for next October when the George Observatory celebrates its 25th anniversary. Right now visitors to the Observatory make do with a view through the 11-inch telescope mounted alongside the big guy.